Is this the pick of the round? It may not have the glamour of Manchester United versus Real Madrid or the history of Barcelona versus Milan, but there is a certain something about Shakhtar Donetsk and Borussia Dortmund this season that can be difficult to put your finger on. The tie has a special feel to it. Both teams have flown, rather unfairly, under the radar for the last couple of seasons only to fully announce themselves in this year’s group stage by knocking out much higher profile opposition. Both sides have flattered to deceive in the Champions League before while establishing themselves as real forces in their domestic leagues, but Chelsea and Manchester City can testify that this season has been a little different. Perhaps what is most impressive of all is the manner in which the English and European champions were dispatched: a remarkably similar mix of form and function resulting in a ruthless application of beautiful football with a tactical edge. This is the thinking person’s tie in which casual observers will be treated to a high tempo battle between two talented and evenly matched sides while the ultra geek can salivate over the tactical outwitting in the dugout that has been years in development through both teams painstaking recruitment process. In such an even game, form is likely to play a huge part on the night. Jürgen Klopp has somewhat stabilised Dortmund over the past couple of months after a shaky start to their domestic campaign. With Bayern Munich cruising along imperiously at the top, and certainly looking to reclaim the Bundesliga title from Dortmund, the best Die Borussen can hope for is a comfortable second place finish. They looked to be well on their way there at the start of the weekend, with third-place Bayer Leverkusen’s away form letting them down, but Dortmund came undone at home to Hamburger, and were the victims of an unexpected 4-1 thrashing. Much of this had to do with the fact that Robert Lewandowski was sent off early on, effectively sterilising their goalscoring power, and insult was added to injury when Marco Reus was ruled to be in an offside position for what appeared to be a Mario Götze equaliser just shy of the break. Klopp refused to blame his players for the defeat, though, and remained optimistic going into the tie with Shakhtar. But his optimism should be cautious. Kevin Großkreutz–whose potency on the wing is one of Dortmund’s most valuable avenues of penetration—has been ruled out with a viral infection. Commentator favourite and Polish international Jakub Błaszczykowski has re-established himself in the squad in Großkreutz’s absence, and will likely play the Champions League fixture. It also remains to be seen whether German international İlkay Gündoğan will be present alongside Sebastian Kehl in midfield due to a reoccurring toe injury. Luckily, the return of Nuri Şahin, from Real Madrid via Liverpool, means the Double Six shouldn’t be too lacking. The fact that the loss of two key attacking players will not diminish Dortmund’s threat in mid-week is a testament to the depth of the squad Klopp has been able to build. Compounding the evidence for the effectiveness of Klopp’s project is the fact that a team largely comprised of young players and perpetual benchwarmers were able to defeat a Manchester City team close to full strength during the group stages. Little needs to be said about the threat provided by Marco Reus and Mario Götze, but neither looked to be in their best form at the weekend. Defensively, centre-back and perennially-premiership-linked Serbian international Neven Subotic will return for the clash after missing Saturday’s game. He passed a fitness test on Sunday and will partner Mats Hummels in the centre. The attacking-minded Sven Bender and Lucas Pisczek will complete the defence, and key to Dortmund’s attack will be Pisczek linking up with fellow Polish international Błaszczykowski on the wing. It will be interesting to see how Klopp lines his side up against the 4-2-3-1 that Shakhtar are expected to start. While Pisczek’s overlaps are often one of the team’s best offensive outlets, Donetsk will be most likely playing two very adventurous full backs themselves in Rat and Srna. The key battle might be therefore which wing partnership deals with the opposing threat better, if either side is instructed to contain, or alternatively which side overstretches themselves a little too much and is caught out on the break. While the traditional policy of playing Ukranians behind the Brazilians has worked on the balance of results this season, neither Oleksandr Kucher or Yaroslav Rakitskiy are excellent stand alone centre backs and their game is based on training, organization and discipline. The most significant team news for the Ukrainians is the January sale of wide attacker Willian to Anzhi Makhachkala, a significant loss on paper even if the alleged £30 million fee is good business for the club. However the mantra at the Donbass arena is teamwork and not individual brilliance, meaning that the numerous other payers struggling to get game time such as Douglas Costa could slot into the side and system without too much difficulty, or indeed new signing Taison might start. Up front Luiz Adriano is most likely to start having completed his one match ban for unsporting behaviour against Nordsjælland in the infamous drop ball incident and will be looking to remind the fans of his more desirable qualities. With three assists he was Shakhtar’s most prolific provider in the group stage and a lot may depend on whether he can either produce more goals than he has to match his obvious talent or whether the rest of the team can reach the end of his pullbacks with the same timing and clinical finishing that Willian often did. In contrasting group games Juventus had much more success than Chelsea in the midfield area, where raw power on the counter attack can be decisive, and Dortmund’s high energy game will suit nullifying Fernandinho’s deep runs much better than other teams this season. Further up, unsung hero Henrikh Mkhitaryan has stepped into the number ten role expertly this season bringing a little less flair than some of the Brazilians around him but a quiet intelligence that will be essential in reading the highly tactical game that many are predicting. 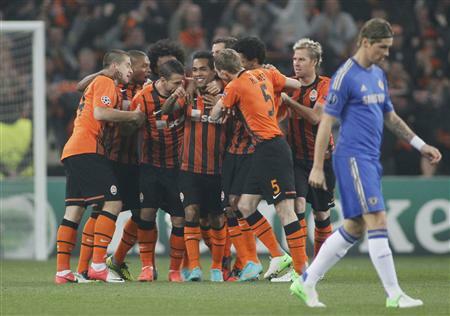 It’s difficult to gauge Shakhtar’s form over the winter due to the lack of competition in the Ukrainian League. While Dortmund have been able to make a degree of progress, the Miners have continued their startling form from the early season with only a single defeat all year. Whether they have remained sharp or become complacent against the lower quality of opposition remains to be seen, but in the group stage they were successful in raising their game for the big opponents, especially at home. A lot is made of the difficulty of an away trip to Donetsk in the media hype and it certainly can be a tricky fixture to get a win, but the big game atmosphere at the Westfalenstadion is an intimidating environment (even if it is diluted to a degree by the all-seater transformation for European games). Whichever side copes with homesickness better will gain a crucial advantage. Whoever wins the tie will certainly be one to watch in the quarter finals, and while Dortmund are being whispered as outside bets to win the competition it would send a real message to the big clubs were Shakhtar Donetsk to triumph. The subtle differences in the two teams approaches might be the key to calling the winner. While both teams look to counter attack to an extent, the manner in which this is done could not be more different: Donetsk have chosen to sit deep in some games and break with mercurial pace, committing Srna and Rat to double up on each wing, while Borussia often seek to win the ball high up the pitch and run behind before the defence can react. With this in mind one key battle will be between Lewandowski and the centre backs (likely to be Kucher and Rakitskiy) because the rampaging runs of the full backs might leave the defence exposed and pressured from the Dortmund frontline. It would be unwise for the Ukrainians to sit deep and break in this match as Klopp will be only too happy to accept this invitation to dominate the territory and attempt to harass the other half. With both teams therefore likely to press, fitness and energy levels, along with the bench, will be important and especially so should the tie go to extra time. The midfield could be where the match is won and given both Jürgen Klopp and Mircea Lucescu’s philosophical approach to the game it would be tricky to guess the six that are likely to face each other on Wednesday night, but whoever out of Şahin, Stepanenko, Fernandinho, Kehl, Gündoğan and Hubschman has gives the best performance can certainly consider themselves to be excelling in a tough crowd. It may not be the most watched fixture this week and without one of the big English or Spanish teams you might be tempted to give it a miss, but Shakhtar Dortmund will quite possibly be a brilliant game of football. Both sides are brimming with talent with highly coveted managers and settled squads of well trained players familiar with their teammates and the system and the closeness in ability between both sides should make this a must see for the purist. This entry was posted in Previews and tagged bender, blaszczykowski, borussia dortmund, champions league, donbass arena, douglas costa, fernandinho, germany, gotze, großkreutz, gündoğan, hummels, jurgen klopp, kehl, lewandowski, Luiz Adriano, pisczek, rat, reus, sahin, Shakhtar Donetsk, srna, taison, ukraine by The False Nine. Bookmark the permalink.